The process of pickling vegetables involves fermentation, often facilitated with the addition of vinegar. The high acid content of pickled vegetables discourages spoilage, which is one reason pickling was popular before the advent of refrigeration. Canned vegetables lose some, but not all, nutrients during the pickling process. Cucumbers are a popular vegetable for pickling. Artichokes, asparagus, beets, cabbage, carrots, cauliflower, celery, green beans, green tomatoes, peppers, okra and onions also respond well to pickling. The amount of fiber in pickled vegetables is usually about the same as cooked vegetables. Fat-soluble vitamins, such as A, D, E and K, are retained during pickling, just as they are when cooked. The Science of Cooking website notes that fat-soluble vitamins could become even more concentrated during the pickling process. Korean researchers have found that kimchi, a spicy pickled cabbage, might have up to twice as much of certain B vitamins as fresh cabbage does. 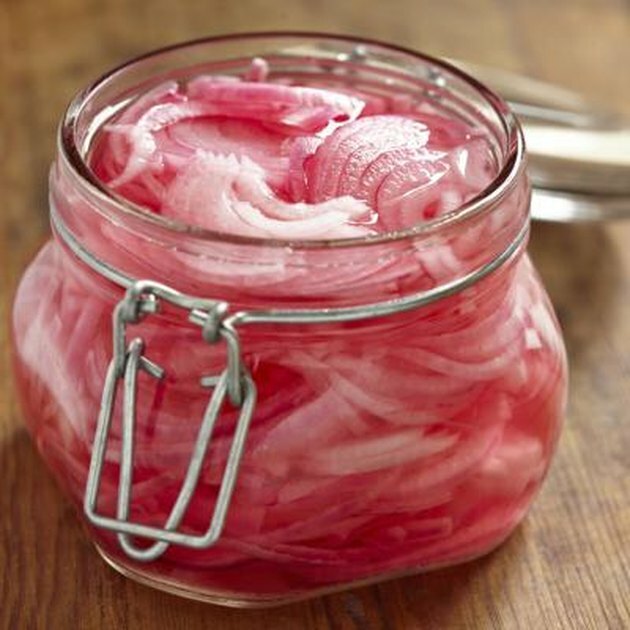 The heat required for canning pickled vegetables destroys much of the vitamin C. Light destroys riboflavin, which means you could lose the benefit of any riboflavin in the vegetables if you keep them in glass jars. Store pickled vegetables in a cellar or dark room to reduce exposure to light, thereby mitigating this problem. Though sodium is a necessary nutrient, many Americans get far more than they need. The large amount of salt typically added during the pickling process is a concern you shouldn't ignore. Too much salt in your diet could raise your blood pressure. High blood pressure -- a greater force of blood pushing against artery walls as the heart works -- can lead to heart disease, kidney failure, stroke or other health problems. Choose fresh or frozen vegetables over pickled vegetables most of the time, but feel free to enjoy pickled vegetables on occasion in small quantities. A small amount of a pickled vegetable can add a burst of flavor to a dish, but too much of a pickled vegetable – or any other processed food – may push your sodium intake into the unhealthy range. Produce for Better Health Foundation: Do Pickled Vegetables Have Any Nutritional Value?